Every now and then I take a break from reading science fiction and heavy nonfiction and dive into some fluff, something purely humorous with no pretensions of substance. 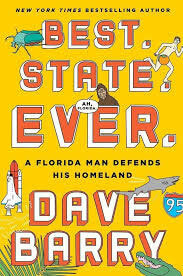 Which brings us to Dave Barry’s latest, Best.State.Ever. : A Florida Man Defends His Homeland. When I saw the book’s garish cover, given that I’ve always enjoyed Barry’s writing, my fascination with the weird and grotesque, and Florida’s well deserved reputation as home of the twisted and demented — it’s the only state with its own Fark tag — I went “Oh yeah!” and picked up the book, which covers Barry’s travels to various oddball Florida communities (yes, that is a bit redundant) and tourist attractions. Barry doesn’t disappoint. In Best.State.Ever., despite its being a very slight book — 229 pages, but with wide page margins (that is, a lot of “white space”), a lot of deliberately tacky, low quality photos interspersed with the text, and very wide leading (space between the lines) — Barry delivers the goods. Parts of the book are funnier than hell, and the book is not entirely substance free: Barry delivers occasional insightful political and social comments along with the humor. Hanging over our heads are speakers the size of Porta-Potties. They’re emitting the musical stylings of tonight’s celebrity DJ, who is known as Alesso. I am not going to get into my usual rant about ‘celebrity DJs,’ a concept that utterly baffles me inasmuch as we’re talking about people who are playing recorded music, which does not require any more musical talent than operating a microwave oven, in the sense that you could train a reasonably bright Labrador retriever to perform either task, yet somehow these DJs are international celebrities who jet around the world getting huge sums of money to play recorded music THAT THEY DIDN’T EVEN RECORD AND MEANWHILE REAL MUSICIANS WHO CAN PLAY ACTUAL INSTRUMENTS ARE STARVING. If you’re looking for some light reading, check out Best.State.Ever. It’s the funniest thing I’ve read in ages.